New Mathcad Express – free to use forever! Most of us like to try before we buy, which is why the free trial versions of many of the software products we supply are so popular. But the new trial version of Mathcad Prime 2.0 offers something different – something much more. It’s called Mathcad Express – a stripped down version of Mathcad that retains many of the full program’s features and functions, and is FREE for you to use for as long as you like! When you download and install Mathcad Express, you’re given the option of a 30-day Trial of the full, unrestricted Mathcad Prime 2.0. As with previous trial versions, that gives you the opportunity to explore and evaluate all that this latest, greatest version has to offer. But if after the trial’s expired you’re not yet ready to buy the full version, you’re not left with a redundant piece of software cluttering up your system. Instead, it reverts to the free Mathcad Express. It doesn’t have advanced numeric or symbolic capabilities, linear, non-linear and differential equation solvers, Excel integration or programming functions. But it does bring you all the document handling features, intuitive equation editing and unit handling features that have made Mathcad so popular, and lets you create and view Mathcad worksheets. It’s a simple task to upgrade to the latest, full version of Mathcad Prime from within Mathcad Express whenever you want. Until you do, or if you decide not to, you’ll still have a highly capable version of Mathcad to use in perpetuity – and it won’t cost you a penny! You can download the 32-bit or 64-bit Windows versions of Mathcad Express, incorporating the Mathcad Prime 2.0 30-day Trial, here. The latest, greatest Mathcad is here! We’ve all known for some time that Mathcad Prime 2.0 is coming – we published a pre-launch interview in the last issue of our Technical Computing Magazine, and have a couple of “sneak preview” videos on our Download Centre. Now it’s here – and we think it’s a pretty exciting release that lives up to PTC’s claim that it’s “the most advanced version of Mathcad ever”. This new version incorporates many of the features Mathcad users missed in Prime 1.0: collapsible areas, 3-D plots, symbolics, a robust Excel component. Performance is great too, thanks to its 64-bit architecture and multi-threading capabilities. Quite a few more functions have been added, and like the previous version, it comes with a full year’s maintenance which includes a licence for your home computer and, of course, all upgrades, productivity enhancements and service pack releases. Mathcad Prime 2.0 is a powerful analysis tool yet easy to learn and easy to use. It was designed by engineers for engineers who are looking for greater productivity, better communication and better outcomes in less time. Overall it offers a very superior user experience, combining the latest document-centric environment for engineering calculations with advanced maths exploration. Take our word for it: Mathcad Prime 2.0 lets you spend more time solving engineering problems, and less time programming, documenting, reporting and verifying your solutions. Or better still, try it out for yourself – you can download a fully functional, 30-day trial version (in 32- or 64-bit) here. 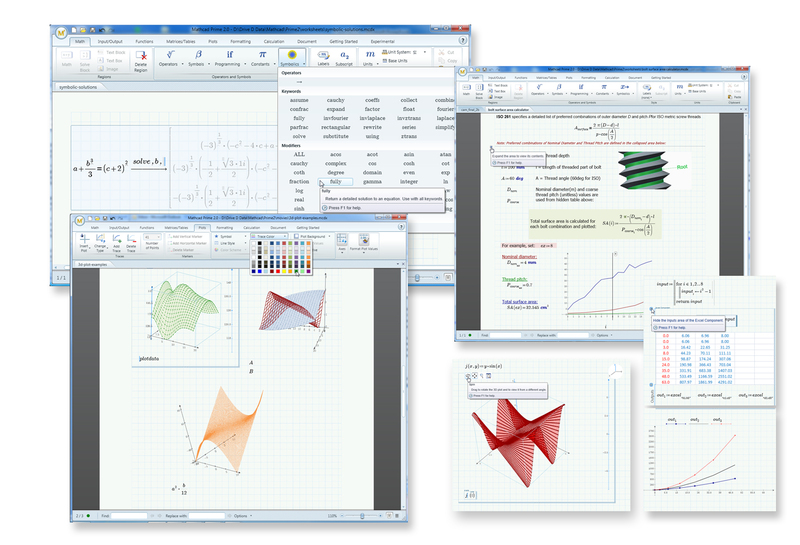 Full details of Mathcad Prime 2.0 are here.